Muppet Trivia IV is now behind us and I can honestly say it was the best one yet. This was my second year co-hosting and the first year that Muppet Trivia has been a Ladies of Comicazi event. I told you in my origin story how important Muppet Trivia is to me as the event where I first met The Red Menace and Smalerie. So naturally, I go out of my way to try and make it special, bigger and better than last year's event, as do my two wonderful co-hosts. But this year, we had a ton of outside help. Seems all you have to do is mention "Muppets" and everyone wants to pitch in. We were very pleased to see so many people turn out to play. For themed trivia nights like these, team names are often a way to show off both your cleverness and your knowledge of the trivia topic. We had some really excellent names this time around, including Riverbottom Nightmare Tribute Band and Mars Grover. We try to write questions with a range of difficulty levels: some easy questions, some hard questions, and many in between. 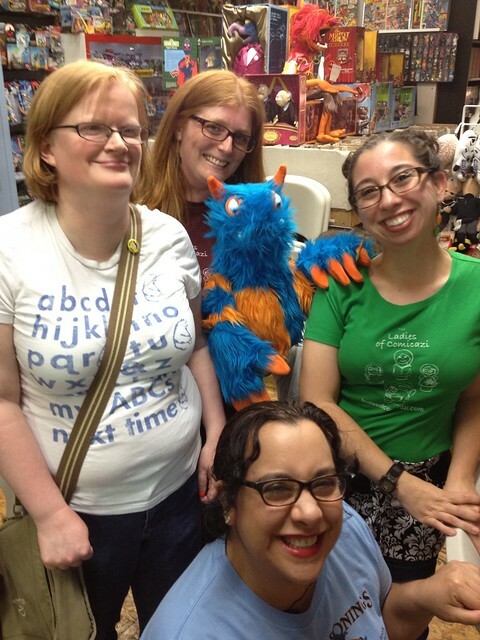 We did toss in a few free points, such as when I walked around the room showing off my beloved ABCDEF-Cookie Monster shirt to remind everyone that Cookie Monster is not a letter of the alphabet. We did a music round for the second time in Muppet Trivia history and two picture rounds, including a "Muppets and Their Jobs" picture round that we may well do again at the next trivia. Some of the rounds were tougher than we expected them to be, but all of the teams did an admirable job and no one walked away without a few hard won points to their name. Muppet Trivia also featured a theme for the first time. Since legendary Muppeteer Jerry Nelson had passed away roughly a year ago, we decided to make this year's Muppet trivia a tribute to him. Jerry Nelson was an answer or part of an answer in nearly every round and the subject of every question for the final round. The teams quickly picked up on this and were able to earn some extra points by guessing "Jerry Nelson" when all else failed. So who won? It was a close competition and all six teams did a great job. But Team Six Silly Muppets knew just a little more about our fine felted friends than anyone else and ended the night in first place. Congratulations to all the members of Six Silly Muppets. Great job, you guys! Smalerie brought the idea of themed food to Muppet Trivia last year with a plate of adorable homemade cookies shaped and colored like Oscar's pet worm Slimey. 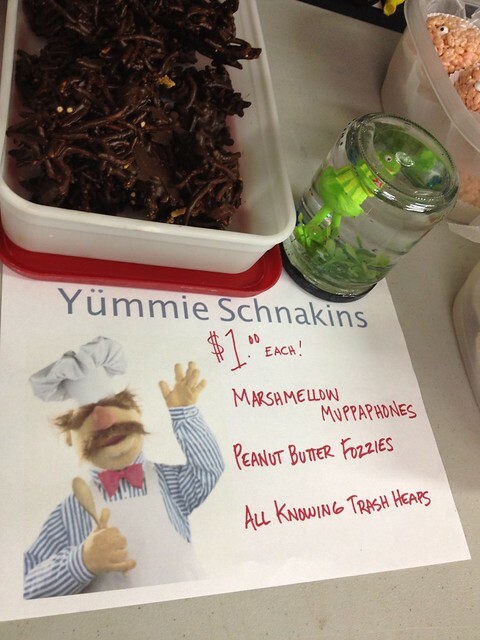 This year we had The Red Menace and Tiny Doom making snacks as well, giving hungry competitors three delicious choice on out "Yümmie Schnakins" table. 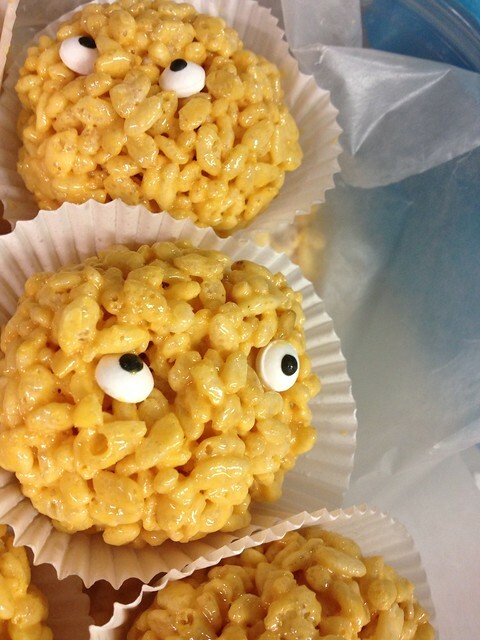 Tiny Doom made Marshmallow Muppaphones, Smalerie made Peanut Butter Fozzies, and The Red Menace made chocolate and Butterscotch versions of Marjory the Trash Heap. The snacks were a big hit, both aesthetically and gastronomically. Proceeds from the sale of the snacks will be used to help offset the costs of running and promoting the Ladies of Comcazi website. Like I said, we had a lot of help putting Muppet Trivia together this year, much of it from friends unexpectedly volunteering their time and talents to pitch in. So to all of the following people, we'd like to say a big "Thank You!" Erica Henderson volunteered to do a poster for the event and came up with this beautiful image. It got so much positive response that we ended up giving copies away as pirzes to the members of the winning team. A few also went home with the hosts. Dave and Tracie brought in some of their impressive collection of Muppet memorabilia and created a pop-up museum of Muppets for people to enjoy before and after trivia. The Goog, official letterer of the Ladies of Comicazi, filled out our sign for the snack table so everyone would know what kinds of tasty snack we had for sale. Comcazi, of course, provided the space, tables chairs, sound equipment, and extra promotion to make Muppet Trivia happen. And thanks to each and every one of you who played, bought snacks, talked about Muppet Trivia online, or just expressed and interest in what we were doing. We really couldn't do Muppet Trivia without all of you who decided to spend your Saturday night answering our questions about Muppets. We hope you had as much fun as we did putting it together and we hope we'll see all of you at the next event from the Ladies of Comicazi.